This two bedrooms, two full baths beach house was renovated in 2011, three years after Hurricane Ike made landfall in Galveston. The house is perfect for a small family, pet friendly with a large wrap around deck. 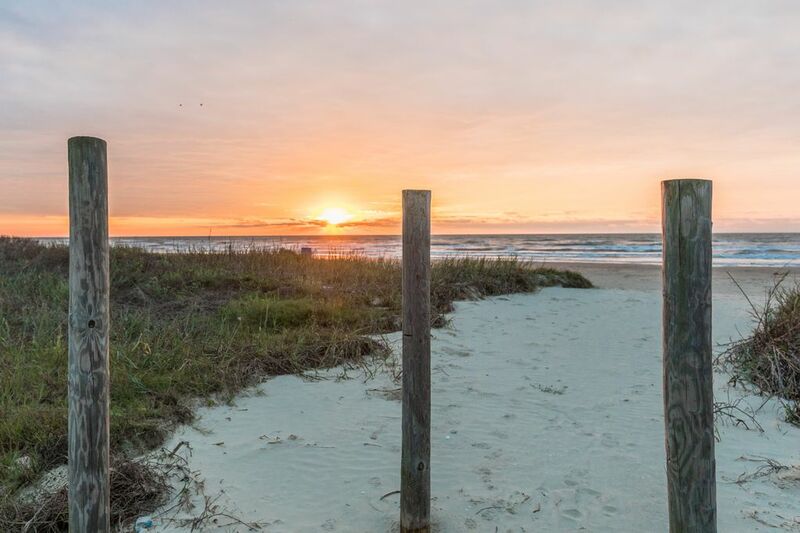 Located in Palm Beach, one mile walk or drive to Galveston Island State Park, and 7 miles to Walmart, Moody Gardens and Schlitterbahn. Take sunset walks on the private and clean beach where vehicles are not permitted. A huge deck is available to enjoy the ocean breeze, have a barbeque with friends and family or to just enjoy a full ocean view. This beach house is your perfect beach get a way. The living area is equipped with a decorative fireplace, TV and DVD player. Two bedrooms has a queen sized bed with a bunk bed and a pulled out bed in an open area right outside the bedrooms. Age Limit: Minimum Age Limit for Renters: All reservations MUST be made by individuals at the age of 25 or older. Adults cannot rent properties on behalf of underage guests. Special occasions : Reservations for Special occasions such as birthday parties, family reunions, etc., must be disclosed at the time of booking and prior approval is required. Prom parties, fraternity or sorority parties, graduation parties are not allowed at any time. Cancellation Policy: Cancellation more than 2 weeks prior to arrival: 100% of deposit and payment refunded. We bought this house shortly after Hurricane IKE in 2009. The construction project to renovate this house was long and costly but we absolutely fell in love with our new beach house and would do it again. The neighborhood is quiet and a perfect place to get away from it all. Why did we buy this house? Our initial intention was to help rebuild Galveston after the devastation of Hurricane IKE. The spontaneous decision transformed into a lot of hard work of clean ups, restorations, and rebuildings. This is no doubt a perfect house to get away from it all. Surrounded by the ocean waves and sea breeze. A quiet neighborhood where neighbors take time to wave hello at crossing on the beach or passing by as you are sitting on the deck. 1. Read rental policies and booking instructions from the owner via www.galveston-vacation-rental.com. 2. Review and sign the Booking Agreement and return to the owner with the deposit. Your reservation is not complete until the owner received the signed agreement.